At Academy Air, we understand the thought process that takes place when you’re searching for your HVAC company. You need a company you can trust for any job, whether it be a quick repair or a full installation. We are a fully accredited member of several HVAC certification organizations to help make your decision simple. An accreditation with the Better Business Bureau represents trust. That trust is built through a code of 8 principles that ensure the highest quality standards in all company endeavors. At Academy Air, we have our technicians tested thoroughly to become NATE Certified. 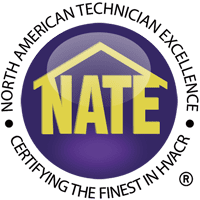 When you hire our NATE Certified technicians you are guaranteed the highest national standard of service available in the heating and cooling industry.